Build up your business in Ireland and make more sales locally. Buy and download our Ireland email database if you need the leads to make waves along the Irish Sea! We've organized lots of contact information of locals in Ireland so that you can market effectively. The beautiful country of Ireland is a powerhouse for many different industries (such as the computer, agriculture, and pharmaceutical industries) and a vitally important European market to build your brand in. Start by talking to great B2B contacts and making a good first impression with emails, over the phone, or through direct mail. You can do all of that with our one Ireland email list, which not only has email addresses but everything from real names to phone numbers to addresses to detailed company information. We have accurate, human-verified information that's ready for you to grab and use right now! Download our Irish email database as a .CSV file and hand it directly to your sales team so that they can influence the influencers locally. They can sort and use this database for multiple campaigns. Or, if you're hoping to save even more time, you can narrow your focus and create a custom mailing list of Irish businesses that are most relevant to you with our list-builder tool. 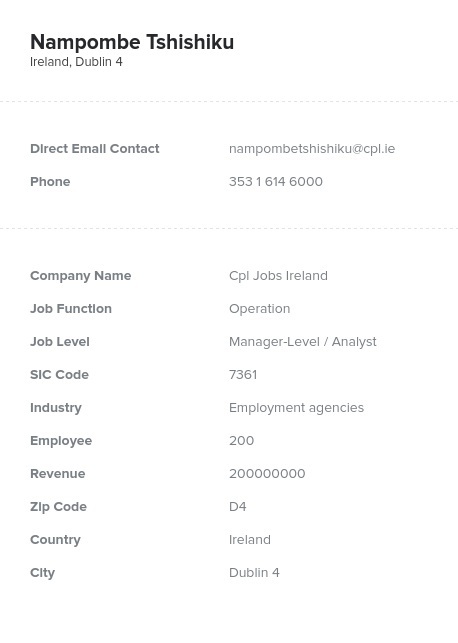 Get Ireland contacts in your industry or simply find them in this bulk, ready-made list. Ireland is full of great people to talk to, and we can help you find the right contacts who would be most interested in your brand! Solve your email marketing woes and free your team to connect with locals in a profoundly new way. Purchase an email list of Irish contacts today.